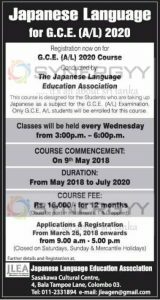 This course is designed for the Students who are taking up Japanese as a subject for the G.C.E. (A/L) Examination. Only G.C.E. A/L students will be enrolled for this course. Classes will be held every Wednesday from 3:00p.m. – 6:00p.m. Sasakawa Cultural Centre, 4, Bala Tampoe Lane, Colombo 03.